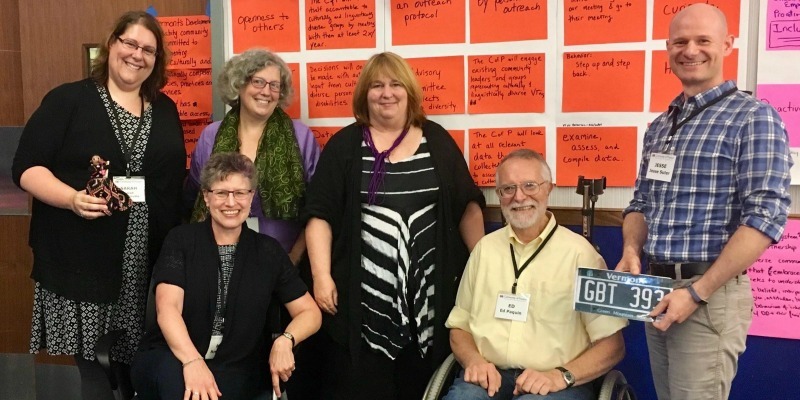 Top row left from right: Sarah Launderville (Vermont Center for Independent Living), Kristen Murphy (Vermont Developmental Disabilities Council), Karen Topper (Green Mountain Self Advocates), Jesse Suter (Center on Disability and Community Inclusion). Bottom row left to right: Amy Roth (Developmental Disabilities Services Division), Ed Paquin (Disability Rights Vermont). In their statements condemning the violence and hate exhibited in Charlottesville, VA last month, both the Association of University Centers on Disability and the University of Vermont urged individuals to remember and act in accordance with the missions of these institutions, founded upon respect, inclusion, and responsibility. Since its inception, CDCI has worked to embody a similar mission: We envision a future where all people, including people who experience developmental and other disabilities, are fully included in their home, schools, and communities. Vermont has made incredible strides towards inclusion, including being the first state to close sheltered workshops, having an internationally recognized program for supported employment, and demonstrating the successes of inclusive education in public schools. However, the organizations responsible for actualizing these visions also know there is much more work to be done to achieve a fully inclusive Vermont, especially when it comes to cultural and linguistic competency. increase the number, diversity, and capacity of formal and informal leaders to transform their state/territorial developmental disabilities (DD) systems by: (1) advancing and sustaining cultural and linguistic competence (CLC) systemically through changes in values, policy, structures, and practices; and (2) responding effectively to the growing cultural and linguistic diversity among people with DD and their families who reside in states, territories, and tribal nations (National Center website: https://nccc.georgetown.edu/cop/). Six individuals representing the aforementioned institutions have already attended a 2-day training at Georgetown University. The next step for this cohort is to identify individuals within the state who are interested in leading the work of the CoP within Vermont. Anyone interested in participating in this CoP is encouraged to contact CDCI’s Interim Director Jesse Suter. In light of the hate and violence experienced across our nation, especially that in Charlottesville, it is important to revisit the missions and visions of community institutions established to educate, advocate, and serve those experiencing discrimination and exclusion. Vermont can do better to address the needs of those who experience disability with culturally and linguistically diverse backgrounds. CDCI hopes the participation in practices such as this will contribute to a more tolerant and inclusive state and nation.